Mildred’s Umbrella Theater NEXT OPENING ……. October 11, 2014 –“Death comes to us all.” It’s a theme found in many artistic works throughout the centuries. This universal truth is ever present in Edgar Allan Poe’s “Masque of the Red Death,” a story that features the hubris of the wealthy, whose attempt to shelter themselves from a deadly plague makes them sitting ducks. The Houston premier of “Red Death,” written by interdisciplinary artist Lisa D’Amour and presented by Mildred’s Umbrella Theatre Company, was inspired by Poe’s renowned story. While the influence of Poe’s work can be seen throughout the play, D’Amour’s creation takes on a life of its own. The first scene opens in the interrogation room. The contemptuous and ever-sassy elementary school teacher/lifeguard Jane Withers (Christie Guidry-Stryk) faces off with a wiry and Detective (Ronald Reeder) as he attempts to shake her down. The topic of this shakedown is Prospero, whose existence she denies knowing, despite living in Grass Lake, Mich. – a town of 600-some-odd people. She also denies any memories of a double suicide that devastated the small town, which happened when she was a child. Jane learns that a cryptic organization called “The Panel” has been observing her, tracking her every move, and now tasks her with a mission: to find the origin of evil, the root of denial and the basic human weakness that causes us to fear death. Headstrong and determined, Jane goes a little bit rogue on her mission. She pursues Prospero (Jon Harvey), following her own plan for smoking out evil, denial and fear as she travels everywhere from exclusive nightclubs in Barcelona to a sewer in Texas. Throughout the entire play, only one set was utilized. The set, designed by Jodi Bobrovsky, was almost like a piece of abstract art in itself. With its stark angles and largesse, this piece had a stage presence of its own. A newspaper backdrop lent itself to each scene: Bathed in blood red light, it set the mood for the play’s more ominous scenes. Then, the backdrop took on a more subtle blue in other scenes. The playwright, D’Amour, was a finalist for the 2011 Pulitzer Prize in Drama and the 2011 Susan Smith Blackburn Prize. She has received several awards, including the 2011 Steinberg Playwright Award and the 2008 Alpert Award for the Arts in theatre. D’Amour graduated with a Master of Fine Arts from the University of Texas in Austin. 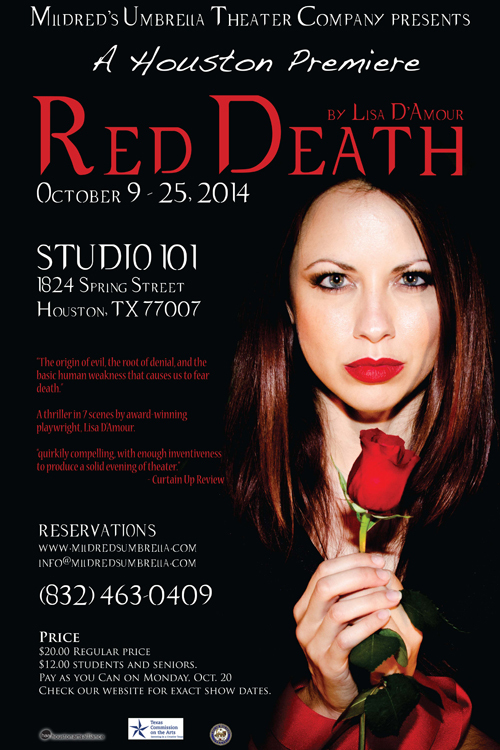 “Red Death,” directed by Jennifer Decker, is performed at Studio 101, 1824 Spring Street, Houston, TX 77007. This venue is a well-designed, intimate setting where, even from the back row, you can clearly see every actor’s facial expression (subtle and otherwise) without the use of opera glasses. Wine and beer – including St. Arnold’s – are available at prices better than what you’ll find at most bars during happy hour, so be sure to bring plenty of cash.